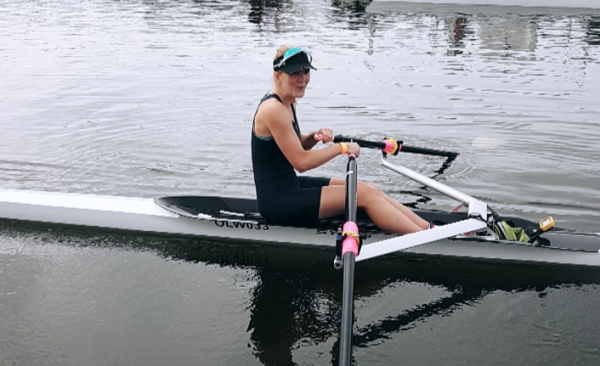 The lightweight double of Naomi Holland and Amanda Thomas, along with Ellie Watts in the lightweight single, represented Oxford and GB Universities at the 2018 European University Games in Coimbra, Portugal. We arrived with a day to spare before racing began, in which we had two practice outings on the lake. The venue was the international standard watersports centre just outside Montemor-o-Velho, a short drive from where we were staying in Coimbra. During the second outing in particular, there was a serious headwind and the water was choppier than anything we’d seen back at Wallingford. We worked to stay positive and remind ourselves of the times we’d dealt with similar conditions in the past, but we knew that if it stayed like this, the races would be tough. We went back to our accommodation and tried to get a good night’s sleep, despite the pre-race nerves, before the first day of competition. The following morning when we got to the lake, we were happy to discover that, though the conditions weren’t perfect, they were definitely better. Fortunately they stayed that way all three days of racing. The first race of the day was the women’s LW1x Heat 1, where the winner would go straight to the A final. The aim of today was to acclimatise to the lake and assess the competition. I finished 5th, with plenty of energy left for the next two days of racing. There were perfect conditions for the repechage the following day. I was up against three other scullers, including a fellow Brit from Cambridge. Although down off the start I kept pushing-on and eventually finished 2nd in a time of 8:19, winning a place in the A Final. The A Final turned out to be a close fight between 4th, 5th and 6th place, with less than 1 second between these positions. I finished 6th overall, and then ate a chocolate croissant. Ellie Watts pushing off for her heat on the first day of racing. The first day of racing was a heat – finishing top two would mean direct qualification for the A final. Our strategy was that if we looked to be in a position to finish top two then we would go for it; otherwise we would save our energy for the next two days. Our start was powerful, but not quite as composed as in our final training sessions. It was enough to keep us in the field – by 1000m we were in 3rd place, and made one last push for 2nd. Once it was evident that 2nd was beyond reach we stepped it down to save energy, still finishing in 3rd. The next day brought the repechage. We took a different approach to the previous day: we rated lower, with a real focus on power per stroke. With this more controlled race plan, we ended up leading for most of the race, eventually coming in a close second and qualifying for the A final. On the start line of the final, I remember a sudden moment of clarity: there was absolutely nothing to lose. The start and the first half of the race passed in a blur – we were somewhere towards the back of the pack off the start, but we found a strong rhythm and by halfway we had broken away from the crews in 5th and 6th. With 500m to go we made a final concerted effort, briefly gaining some ground on the German and Dutch crews who were battling for 2nd and 3rd. It soon became clear that we had given all that we had. By the final 100m my vision was blurring, and I’m pretty sure by that point I was simply dead weight that Amanda carried over the finish line (Amanda reports feeling similar…!) We finished 4th, behind crews from Portugal, Germany and the Netherlands, happy with our performance and knowing that there was no way we could have done anything more. The lightweight double crossing the line in second place during their repechage. It was great to have the chance to compete against some of the best university crews from all across Europe – we all definitely learnt a lot from the experience! Many thanks to Chris and Clive for their invaluable coaching and encouragement all year and for this amazing opportunity. 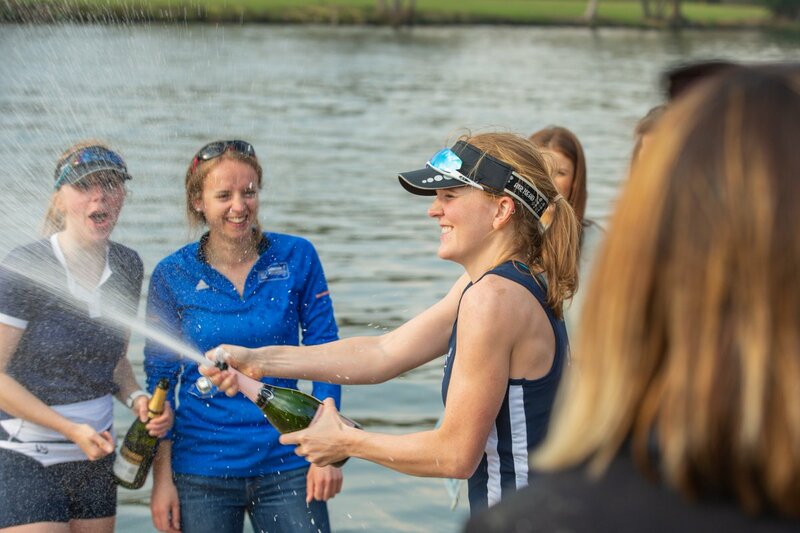 Thanks also to OUWLRC, Oxford Sports Federation and everyone who supported our crowdfunding campaign for helping us get to this incredible event. And a final shout out to the EUSA mascot DUC, pictured below, for just being generally brilliant. 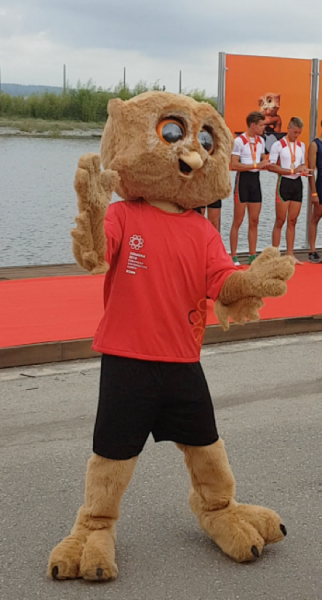 DUC, the EUSA mascot, entertaining spectators during medal presentations.